Carefully disassemble the clock machine. Hook up two wires directly to the Lavet type stepping motor winding. You can take out the original circuit or let it in place. In the latter case, make sure you disconnect at least one wire of the winding from the original circuit to avoid interference. Design files for the interface are available in the eagle branch. It has been made using EAGLE 7.2.0. 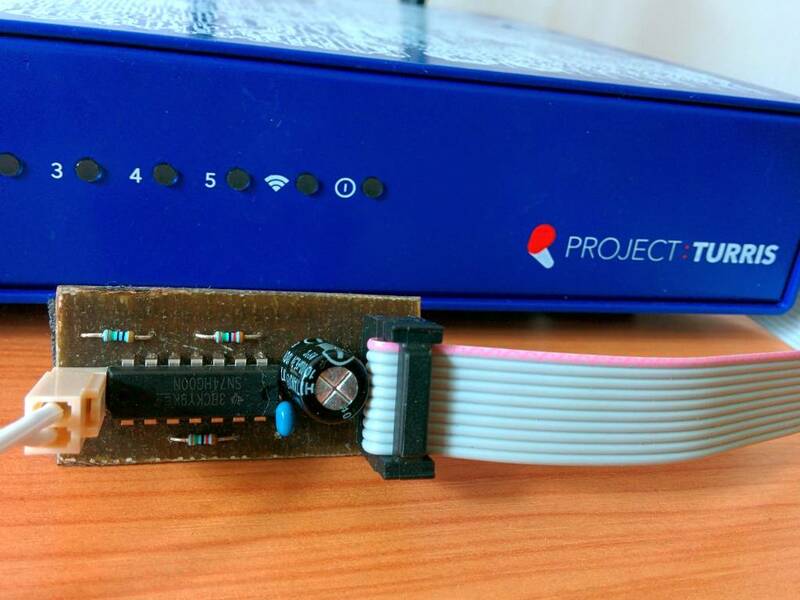 The interface connect the clock motor to GPIO connector (P3 on the Turris board) via 10-wire flat ribbon cable. After regular shutdown of the control software, the state of the clock is written to /root/clockstate.txt from which it is reloaded on next start. If there is RTC NVRAM available in the sysfs, the hand position is stored there after each step and reloaded on start. 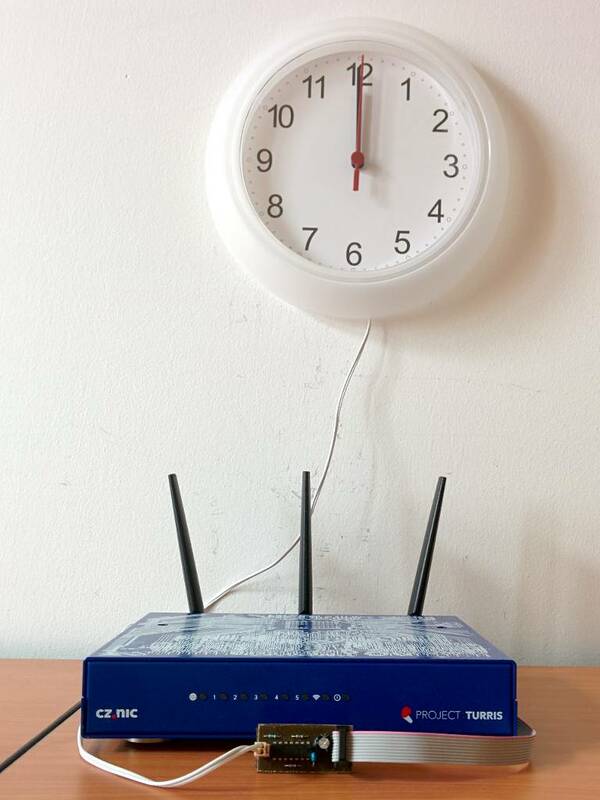 The clock can therefore restore operation even after a power outage. Since the Lavet motor requires polarized control pulses, if pulses are inverted, the clock appears one second behind. In that case, the polarity of control pulses has to be inverted. 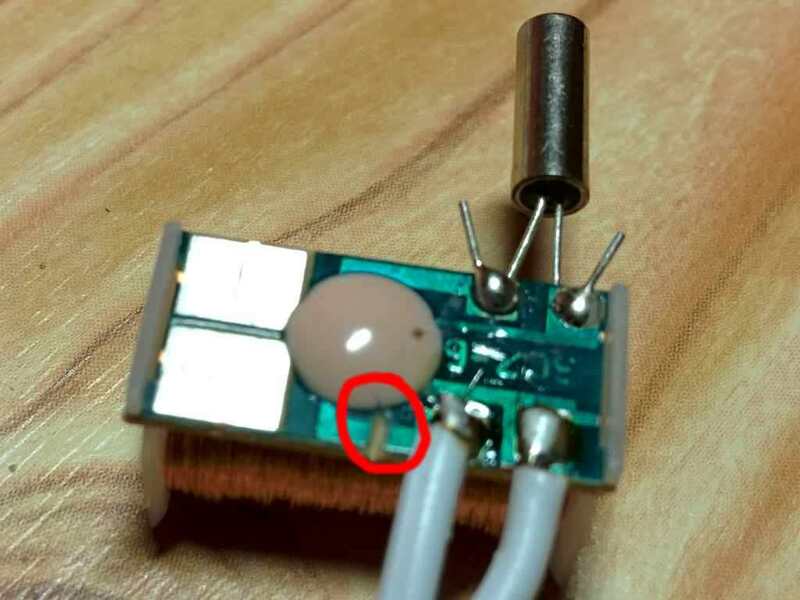 It can be done in hardware by exchanging the wires connecting the Lavet motor, or by using command line switch --invert. Information about polarity inversion is also stored together with the clock state. When the clock state is just a few minutes ahead of current time, it's usually not useful to go fast forward all around the clock. Doing so would take much more time than just waiting until current time reaches the clock state. The software therefore computes what approach leads to faster sync and act accordingly. To appease users during waiting, a comfort step is inserted every 10 seconds (configurable with --comfortstep command line argument). problem is usually in poor quality of the clockwork, eg. unbalanced hands, big backlash, etc. This could be solved by saving the clock state after every step into the SRAM of battery-backed RTC chip inside Turris. However, there is no driver support for this SRAM yet. 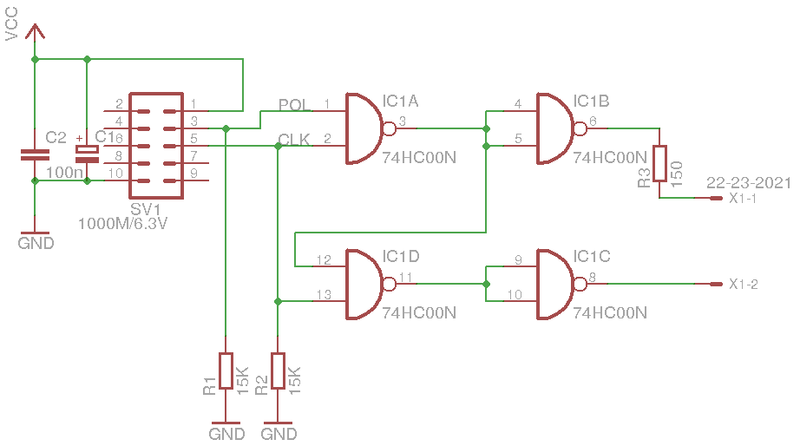 This is already fixed by storing the state into the SRAM of battery-backed RTC chip. With recent Turris kernel, this should work out-of-the-box. Locking is not implemented yet. Patches are welcome!